Where for Care – Where you go for care matters. Whether it's a snake bite or another ailment, where you go for care matters. Plan where you'll seek treatment before you need it. Make the right care decision - for your health and your wallet. When you have an unexpected health need – whether it’s an emergency or a small pain – you must choose where to seek help. Where you go for medical care can affect how much you pay, how long you wait and the type of treatment you receive. Don’t wait until you have a health issue to learn where you should seek treatment. Learn about your options now so you can act quickly – especially in an emergency. 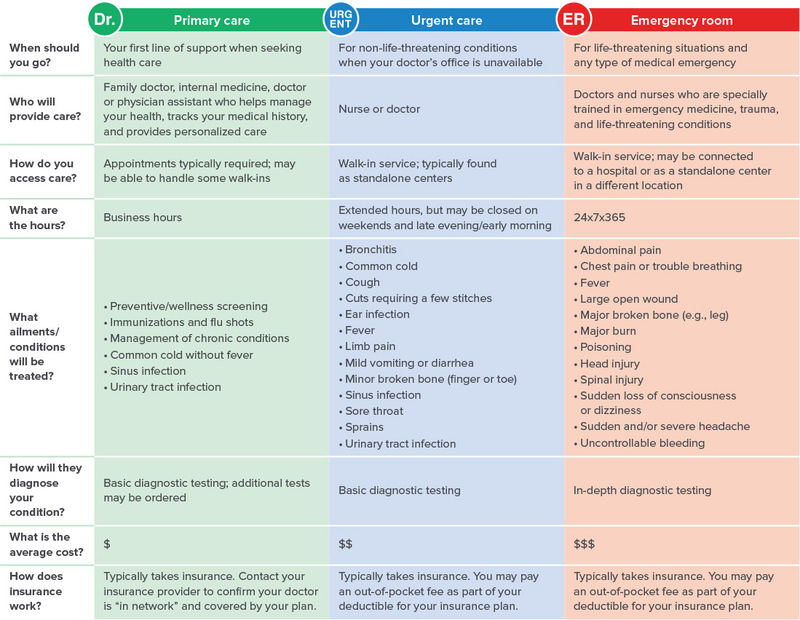 There are three common care providers: primary care, urgent care and the emergency room. By learning which one to visit, you can make the best decision for you, your health and your wallet. Download a family care plan worksheet so you know where to go from any unexpected health need. If you are experiencing an emergency, call 9-1-1. For all other cases, before you go anywhere, call your insurance provider to determine what is covered by your plan. Most insurers offer a “Nurse Advice Line” that can direct you to the right level of care based on your health issue.